What would it take to get Los Angeles residents to drive less? New research indicates that building light rail is working well. A study from the University of Southern California of the new Expo light rail line — which opened in two phases last year and runs 8.7 miles west from downtown — found that people living near stations significantly reduced their driving. USC researchers tracked the travel behavior of 103 subjects living in neighborhoods within one-half mile of a station. The results were compared against another set of people with similar demographic characteristics who live more than a half-mile from a station. Both groups had the same travel habits before the light rail line opened, and no one in either group was told they were participating in a study of the Expo Line. Researchers called the changes in travel behavior among residents near the new transit line “striking.” After the line opened, households within half a mile of an Expo station drove 10 to 12 fewer miles each day relative to the control group — a reduction of about 40 percent. Those households also reduced their vehicle carbon emissions about 30 percent. In addition, there was some evidence that the transit investment increased physical activity among nearby residents. The subjects who had the lowest levels of physical activity increased their daily exercise by as much as eight to 10 minutes a day, the study found. For out of towners, this is the same line that the “libertarians’ at the Reason Foundation declared a complete failure because it didn’t meet its twenty year ridership projections on its third day of operations. Maybe someday *gasp* they’ll have it actually go to the LAX airport. That is if the cab companies let them. Cab companies? In another 5 years it will be Uber and Lyft for the iPhone’d elite. I doubt the cab companies will have much money to lobby against LAX transit then. Sounds very promising, but I’m confused as the study summary stated that there *might* be a statistically significant increase in rail trips of ~0.1 trips per day. How does one more rail trip every 10 days translate to the equivalent of 10-12 fewer vehicle miles traveled each day? Does each rail trip replace, on average, about 100-120 miles of driving? Or does the mere presence of a rail station lead to fewer miles driving and more miles walking, even if there isn’t that big an increase in trips by rail? If possible, I hope someone who worked on the study can answer. Why do people keep claiming that cabs had something to do with this? The Green Line was built by stringing together a right-of-way from the newly constructed 105 and the Harbor Subdivision right-of-way. That’s why it goes “from nowhere to nowhere” in the popular saying. They put the station as close as possible to the airport given that right-of-way. Trying to bring the line to the terminal would have required a massive construction project that would have been much more expensive per-mile than anything else on the project, and would also have increased travel times between the Harbor Subdivision stops and the 105 stops by a large amount. Now maybe they should have done that, but one doesn’t have to postulate a conspiracy by the all-powerful taxi lobby to think that Los Angeles in 1995 just wasn’t willing to spend the billions of dollars on top of the price they did pay, just to connect the “nowhere” of the Green Line to the airport. If you dig a bit deeper, you’ll see that the number of minutes per day spent walking increased significantly, and so did the number of bike trips per day. Right – I noticed the increase in bike trips too. I’m guessing that might be caused by other variables, like the significant increase of bikeway miles that LA has put in. From my scan of the report, I didn’t see any mention of this. The decrease in VMT is great, but I think the report authors need to be careful what they attribute it to. To insinuate the light rail is solely responsible for the drop in VMT doesn’t seem totally accurate. Or maybe I missed something from the report. That page is very useful. Thanks for linking to that summary of studies. Not entirely true. There’s a still-visible wye-junction that was intended to serve the airport, but it was killed for “various” reasons. This will actually be incorporated into the Crenshaw line, which will have a station on Century / Aviation. I know. I meant it beating ridership projections 20 years ahead of schedule–it actually beat them 7 years ahead of schedule. It’s more complicated than that. The spur to LAX was supposed to be done concurrently with a near complete rebuild of the airport. That rebuild still hasn’t happened, and airport transit continues to be terrible. When phase 2 of this line opens and terminates within 4 blocks of the Santa Monica Pier, there will also be a stop within walking distance of the Reason HQ location. I think they’re actually very careful to control for a lot of this. These differences that we’re talking about also compare the changes over the same time period between people who live within 1/2 mile of Expo and people who live farther from Expo and closer to Crenshaw. It may be true that bikeways were improved more along Expo than they were in the other study areas, but at any rate it’s not just an artifact of the citywide improvement in bikeways. 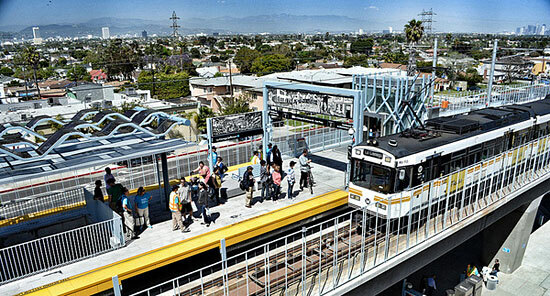 This is also a case where the Expo Line connects to many destinations along the line which is key to reduction of car trips and improved physical activity to the corridor. USC, the Museums in Exposition Park, the Coliseum (to watch UCLA beat the pants out of USC this year) are destinations along the corridor that will directly correlate to the reduction of car trips because there’s no an alternative to get there. I’m just imagining how the Reason Foundation people get around … giant 1970s land-yachts belching smoke…? Watch ‘Despicable Me’ sometime to see a “Reason-mobile”. A new study shows women are about half as likely to use new rail service as men — especially if they express strong concerns about safety.